Each page of the book presents a different family member or friend expressing their love for the newborn baby (i.e. the daddy, the grandmother, the grandfather, the uncle, the baby brother, the dog, the neighborhood mothers, and the neighborhood children). 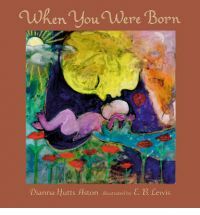 It’s a very precious book to enjoy with your child or considering giving someone as a baby gift.